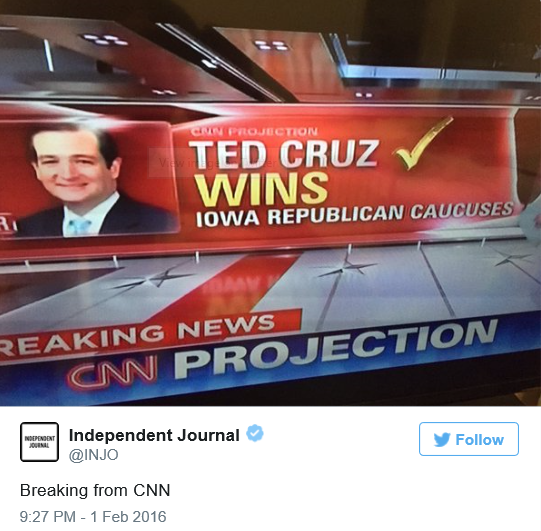 US Senator Ted Cruz pulled off an upset over billionaire candidate Donald J. Trump to take the top spot in the Iowa caucuses Monday night. While Iowa’s 1,681 precincts may have additional votes trickle in over the course of the evening, both Ace of Spades Decision Desk and NBC News, both respected election night watchers, called the Caucus for Cruz. US Senator Bernie Sanders and Secretary Hilary Clinton are still tied.